Every Monday I’ll post a new short story here, based on an image somebody out there has sent me. Welcome to the 52. For this first story I’m collaborating with photographer and guitarist Casey Tibbs, who provides the visuals and starting point below. You can click the image for a larger version. It’s awesome. The villagers gathered at the Moonlight Tree, as they did each year, and stared up at the fierce crush of cloud that filled the sky in all directions. It was night, and so there was little to see but a vast, unnatural darkness. The Smother. Every year it stole the moon from them. Every year they made their sacrifice to drive it back. Burning torches blazed on long wooden poles that had been driven into the ground around the ancient tree. The flames did strange things to the leaves, setting shadows to a frenetic dance. Nobody stepped inside the ring of light, for that was a privilege reserved for the one with everything to give. Even the wildest of the children kept their pranks and antics to the safe side of the invisible line. Old wives nattered in the crowd, while young ones slumped with easy contentment in the arms of husbands. Men and women alike breathed the smoke and honeysuckle of the night and dreamed that one day they too might climb the tree to take the moon back. They parted to let though the elders and the Chosen One. Old Tomas, his fiddle tucked beneath his arm and his cheeks flush with pleasure at the attention his service was bringing him, stumbled along behind his betters. All year the villagers had competed to find the one with most to give. Tomas had practised for a lifetime, taking his place in the heats each year only to be knocked out, and finally his talent and perseverance had paid off. This was the year when he was the very best the world had to offer. Others had gone before him, and more would follow, but this night was his. There was a moment’s embarrassed pause as he reached the base of the behemoth and struggled to haul himself to the first bough. Time had been gentle with his dancing fingers, but smiled less kindly on his shaking knees and creaking back. Nobody broke the circle to aid him, although two young fishermen held a stepladder at the ready should the old man wish to take it from them. Tomas chuckled, and ran a liver spotted hand over his thinning white hair. His self-deprecation charmed the onlookers, warming them through, and when finally he found his purchase on the silvery wood he earned an enthusiastic round of applause. The din faded as he climbed, and by the time he reached the thick splay of branches at the top of the trunk, on which a man could stand with ease beneath the heavens, there was only the susurration of the leaves to wish him good fortune. He stretched, brushed down his freshly pressed tunic, and tucked his fiddle beneath his chin. The ancient maple was near as tender as his wife’s lips had been, and he took a moment to wish that she were there to hear him play. The first long note that he drew with the bow was like wine in a crystal glass. The gathered peoples sighed as one, and as his mournful tune caressed the forest they gazed up at the Smother in familiar expectation. Tomas too looked up, waiting for the first break in the cloudbank and the icy glow of the returning moon. The Smother thickened with disagreement, and turned its back on his piteous little gifts. The following day, with the sun high and birdsong to console them, the entire village gathered in their little hall to discuss the matter further. Old Tomas did not attend, for his shame and grief were yet too profound for public spectacle. All agreed that something was amiss. They had fielded their finest musician, offering his gift in return for the absent moon, but the Smother had rejected them. This was unprecedented. All had competed, as all had competed the previous year and would compete again in the months to come. There was no question in anyone’s mind that Old Tomas had outplayed them all, much though each would wish otherwise. The Smother would only accept the very best, and none among them could challenge Tomas’s art that year. They drew the only conclusion they could. Somebody had failed to compete. Somebody new, who nobody had noticed arrive. Daniel lived in a small hut beside a stream on a high hill, with a pig that he could not bring himself to slaughter, and chickens who looked at him with reproach each time he reached for an egg. He had not been there for long, but had everything he desired. His old life, in his old world, had been a disappointment of mayhem and treachery, and he was glad to be free of it. He had his music books, and his guitar. That was all he needed to be himself. He had never gone to the village, although he knew that it was there. Daniel did not need people. Yet the people needed Daniel. Once a search began his hut, that had not been there the previous season, was easily found. It was clear to all that this newcomer could have no idea what he had wrought by failing to compete and sacrifice, and a gruff elder called Sebastian was elected to go and inform him. Sebastian had an enormous beard, and wore heavy boots. He trudged up the thin path to the small hut, rehearsing his explanation in his mind. By the time he reached the dwelling he was breathing hard, and his legs ached. While he paused to recover, savouring the crisp clean air, he admired the pig that snuffled in the weeds by the side of the house. The pig took a moment to admire him back, then returned to its important snuffling. The young man was not the first hermit Sebastian had dealt with. They were always a little peculiar. It was the isolation. “I am Sebastian,” he said. “Okay,” said Daniel, and pushed his glasses up his nose with a careful finger. “Thank you.” He closed the door. “Yes,” said Daniel. “I know.” He started to close the door again, but this time Sebastian caught it with a well muscled forearm. Daniel looked surprised, and a little worried. “Probably.” Daniel had never practised false modesty. Daniel patted his arm. “It’s terribly nice of you to offer, but I already have a pig. It doesn’t dance, but we seem to get on. I’ve got some chickens too.” He nodded to the other side of the house. Several chickens were lined up, giving them a look that made it clear that should they take but a single egg they would be harshly judged. “Everything I dreamed about is right here. Good luck with your moon thing though. I’m sure it will work out.” He closed the door. As Sebastian trudged back down the path, frustrated and confused, he heard the wail of a music he had never before experienced. It set fire to his blood, and made him daydream about love and battle. The young man with the glass things on his face had left them no choice. They would go to the witch, and she would make him play for the Smother. The villagers, who were becoming curiously accustomed to spending all their time in one big crowd, gathered outside the witch’s hovel as Sebastian approached the door. It was a very nice hovel, with a brushed clean welcome mat on the step and a well-kept flowerbed beneath the window. The door opened as the elder drew closer, and more than one member of the crowd felt a twinge of disappointment that it did not creak. Inside, the room was gloomy. There were shapes that could probably be attributed to furniture, and because Sebastian was not a man of vast imagination he did not to turn them into huddled beasts awaiting. When a shapeless bundle in the corner stepped forward, he did not flinch at all. “Hilda the witch?” It was a foolish question. Everybody else in the village was outside. A process of elimination meant that there was nobody else this could be. “Then it is time to have new wants.” She shucked off the rags, which dropped to the floor around her. She had thick black hair that fell in waves to her dusky shoulders. Her lips were the very wildest red, and her eyes were deep and mellow. He had never seen her like. “I have a pig…” It had sounded terribly convincing when he told Sebastian, but now it seemed irrelevant. She stepped inside, leaving her rags on the step, and closed the door behind her. 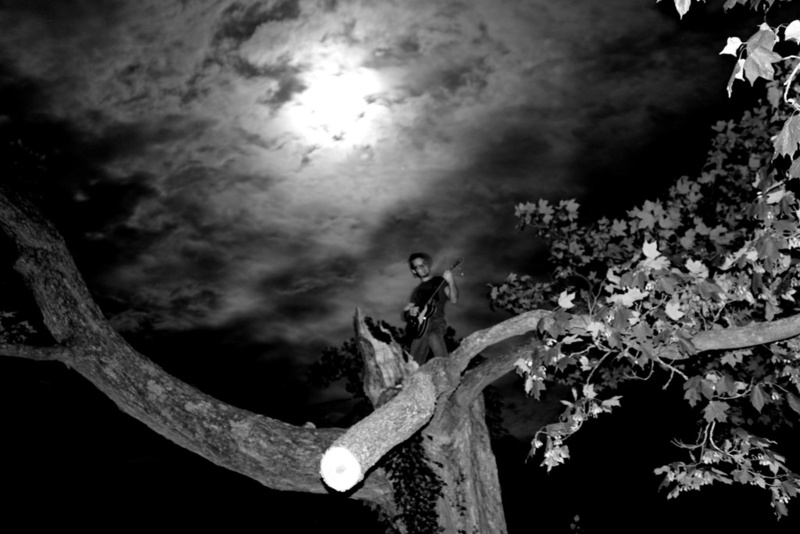 Daniel stood upon the Moonlight Tree, and wept as he played. His fingers had always been music, but as his guitar screamed and thrashed at the Smother, tearing through to seize what the villagers desired, he could feel their magic dying. The clouds thinned at his demand, the Smother satisfied that it had the very best the world could offer. At the base of the tree villagers cried, and made love, and fought with knives. It was a wild thing, Daniel’s music, and they suffered for unleashing it. Light played over the sky, silver white and haunting. Daniel’s fiery chords fed the greedy Smother until it was sated. The moon broke free. Stars spread across the void as Daniel watched. His guitar was dead and clumsy in his hand. He had forgotten how to make it sing. Below the witch was waiting with his prize, and he understood then that it would never be enough. She had shown him new needs, and he had broken on them. There would be the moon, and phalayshio, and a pig, and endless days of quiet desperation. The Smother was not banished. It was absorbed. When he one day went to the grave, there would be no song left in him. Casey Tibbs is a guitarist, photographer, husband, and father. He steals time to make art when he can. If you’re in the Toledo area and need somebody to photograph stuff for you, you should check out his website here. And so The 52 begins. I hope you enjoyed ‘The Smother’, but if not then pop back next week for something different. If you think somebody you know might also enjoy the story, please tell them about it. Nobody will ever find it otherwise. All of the stories in this project are free, and will stay here indefinitely. If you want to support my writing in general, or the publishers that I’ve worked with down the years, then buy a book one of the times you swing by. My new novel The Flesh Market is a good place to start with my longer fiction. If short stories are your thing, and you enjoyed ‘The Smother’, then you might also like my story ‘The Many Lives of Zorro’ in Wildthyme in Purple. Absolutely brilliant, Richard!! I’m thrilled to be a part of this collaboration! You must have pulled some magic out of that photo. Despite our knowing nearly nothing about one another, your story really hit home.. in unexpected ways! Look forward to reading the rest of The 52! Actually Nicole, my wife used to be an amazing fiddler. Glad you enjoyed it Casey, and thank you for starting things off. ‘The Smother’ would never have been written if you hadn’t made it with pictures before I wrote it. There should be another along in a few hours – enjoy it when it lands!